Living in a tiny house is somewhat of an art. Every space has to have a purpose. Every item within that space must be carefully scrutinized as to whether it is truly necessary. 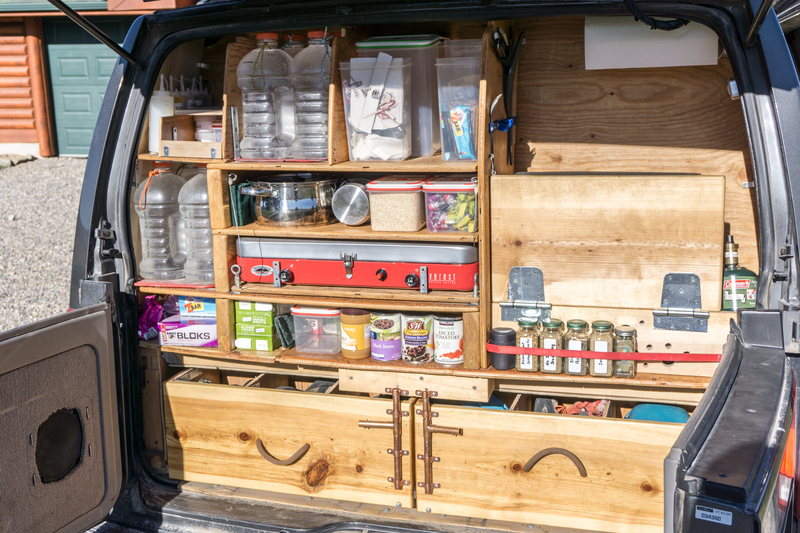 At less than 60 square feet, a good deal of thought went into the design and set up of our van in order to make it a live-able space for not one, but two people. The design is extremely customized to our own personal needs, which we have dialed in over time and are constantly improving and tweaking. Our bedroom is accessible by the sliding door on the side of the van or through a sliding door in the wooden divider that separates the front seats from the rest of the van. Our bed, made of two crash pads and a piece of foam, sits on a raised platform, which allows ample room for gear underneath. While limited head room is definitely the biggest downside of our van, the amount of time we spend in bed is fairly limited (and almost entirely spent laying down), so the amount of gear storage we gained made the decision a no brainer. 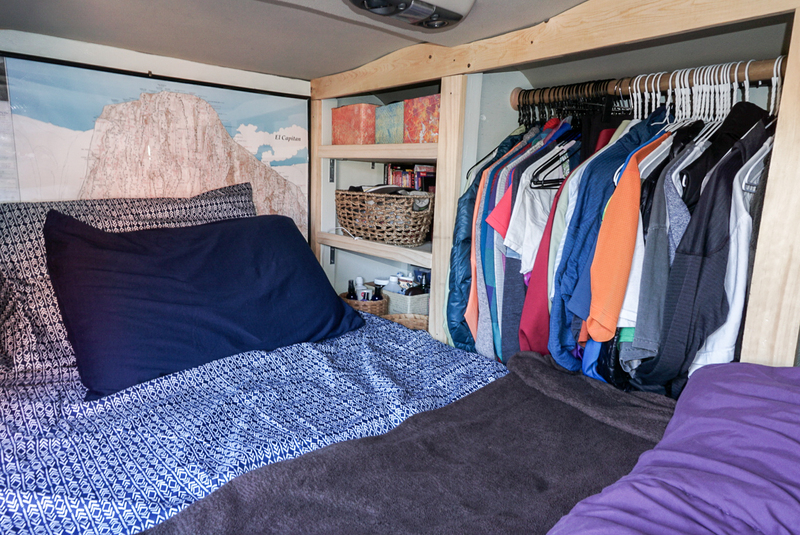 One of our favorite parts of the van is our headboard – an AAC poster of El Capitan. The far side of the bedroom is valuable storage space for non-climbing ‘stuff’. The right set of shelves are the “office and electronics” space; Adam and I each have a designated cubby to keep our lap tops and work supplies, while the bottom shelf is dedicated to dirty laundry. The middle space is our clothes closet (Adam’s clothes are on white hangers while mine are on black hangers), which include the essentials and nothing more. The left set of shelves hold our library of climbing guide books, socks, shower essentials, and other miscellaneous items. Underneath our bed platform, we have three giant gear drawers, two that slide out the back doors and one that slides out the side door. 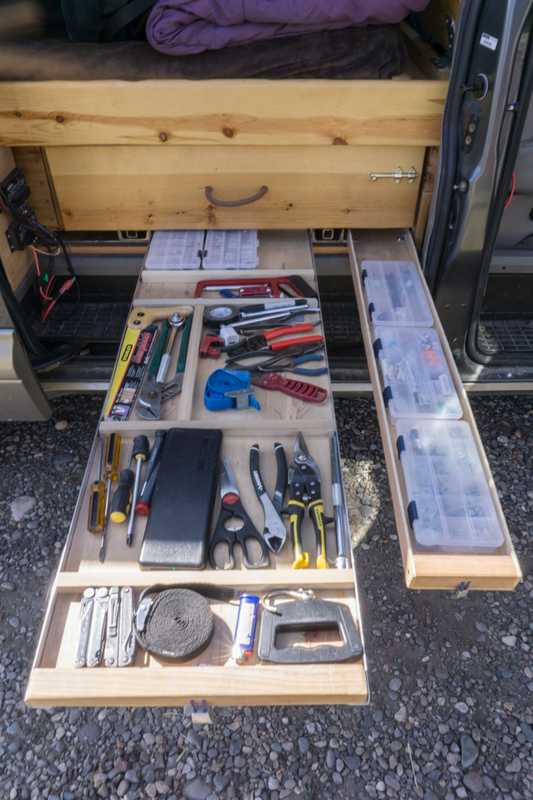 Each drawer is divided into smaller compartments to store specific gear in specific places. A key piece to van life (at least for us) is having a designated space for everything. This not only prevents you from bringing too much extra ‘stuff’, but also makes it that much easier to put everything away after using it, rather than throwing it on the bed to deal with later. 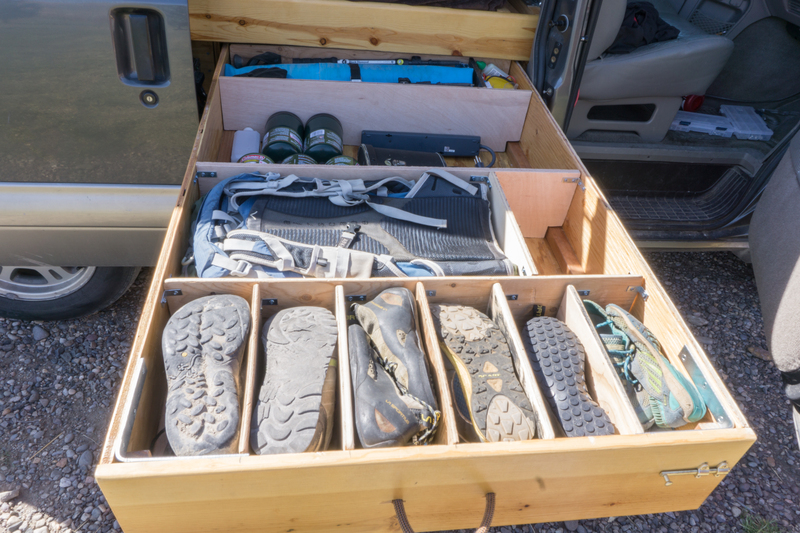 Our side drawer stores our car jack, big wall haul bag, trekking poles, approach shoes, running shoes, backpacks, extra stove fuel, and some other miscellaneous items. 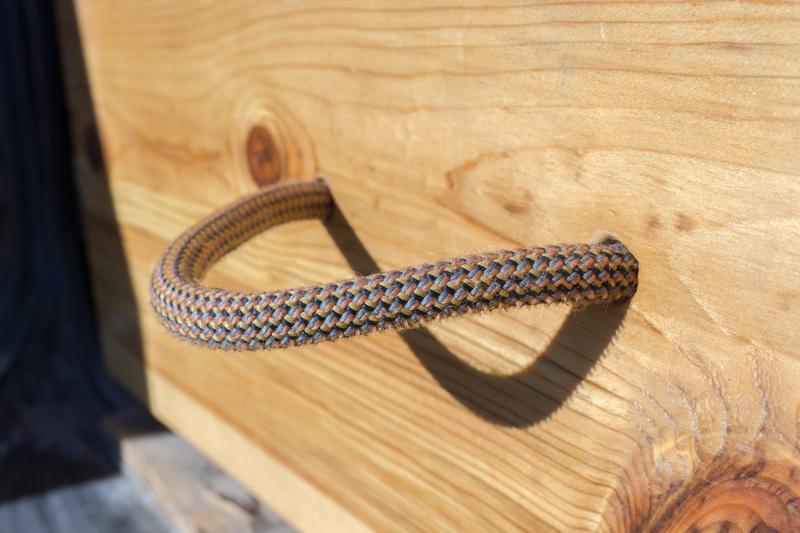 We used an old retired climbing rope to make the handles for our gear drawers. 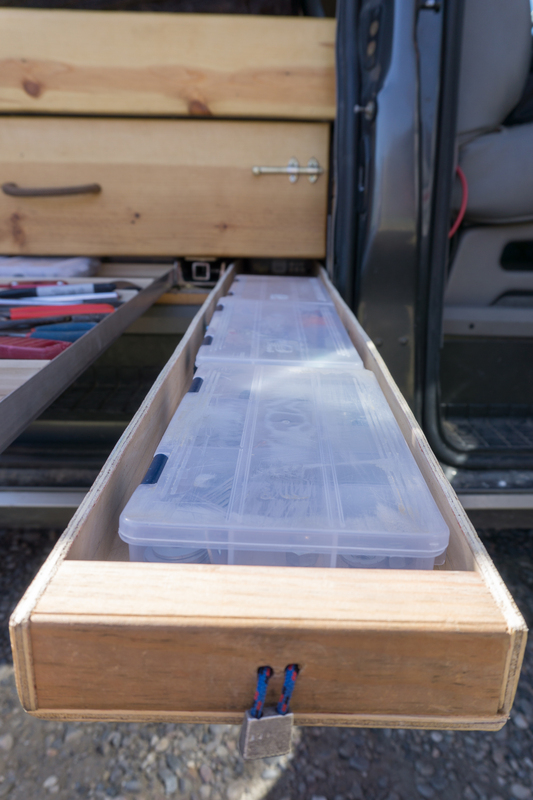 After building our side gear drawer we were left with empty space between the steel drawer tracks. 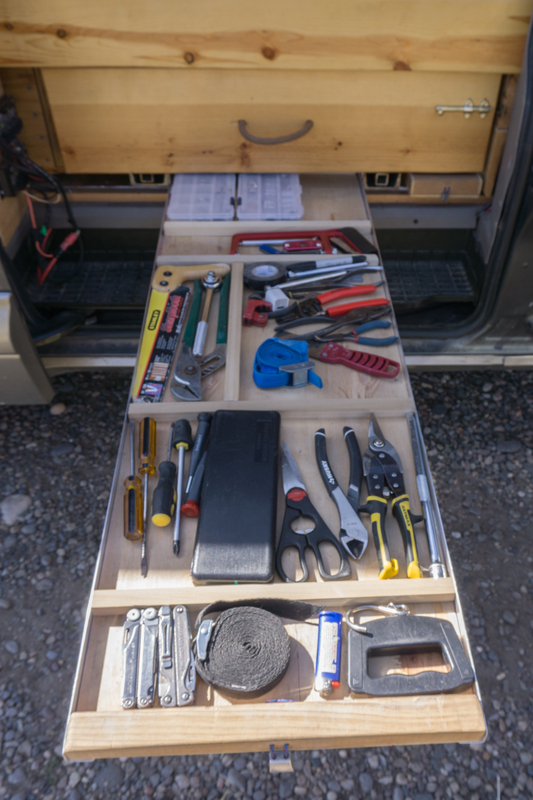 Since wasted space in the van isn’t an option, we utilized it for tiny ‘secret drawers’, which perfectly store Adam’s tools out of the way. 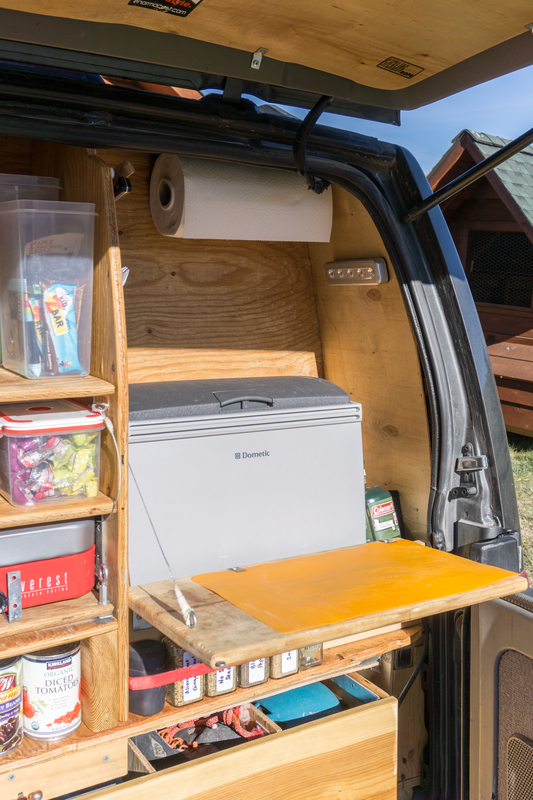 The back hatch on the van opens up to our kitchen, which stores all our food, water, pots, stove, and utensils. We have 8 one gallon jugs we use to store water for cooking, drinking, and washing hands/veggies. Since we pack water jugs for multi-day big wall climbs, it made more sense to use them to store water rather than packing them and also packing a large water jug. The bottom most shelf was purposely sized to the height of cans to conveniently store black beans, tomato sauce, and other food staples. 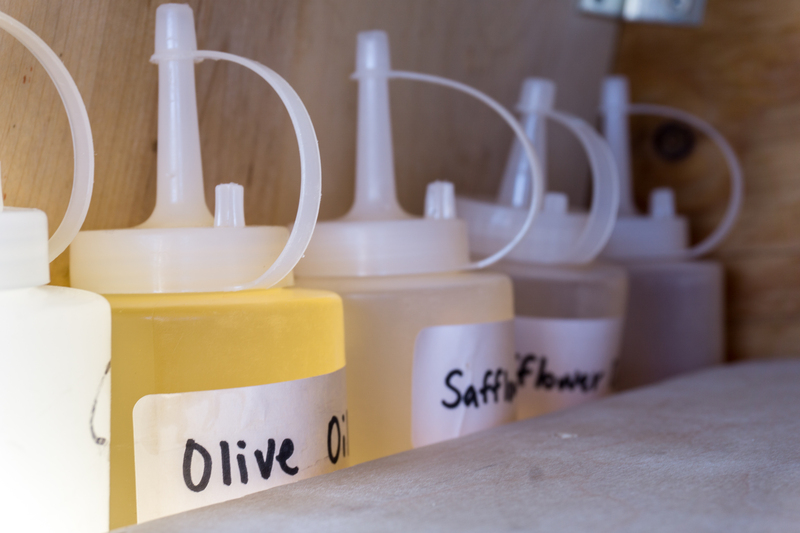 Reusable plastic bottles securely store soap for washing dishes and various oils for cooking. 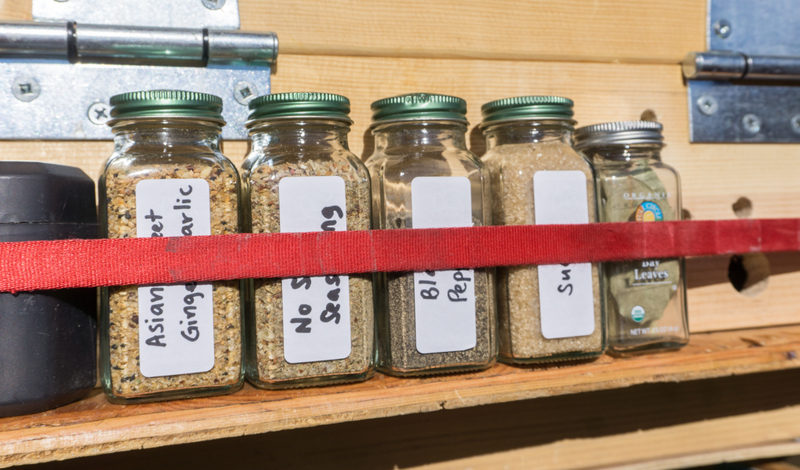 We found spice containers that perfectly filled the extra space between our shelf and the back door. Our stove sits on a shelf, which pulls out for cooking and neatly tucks away the rest of the time. 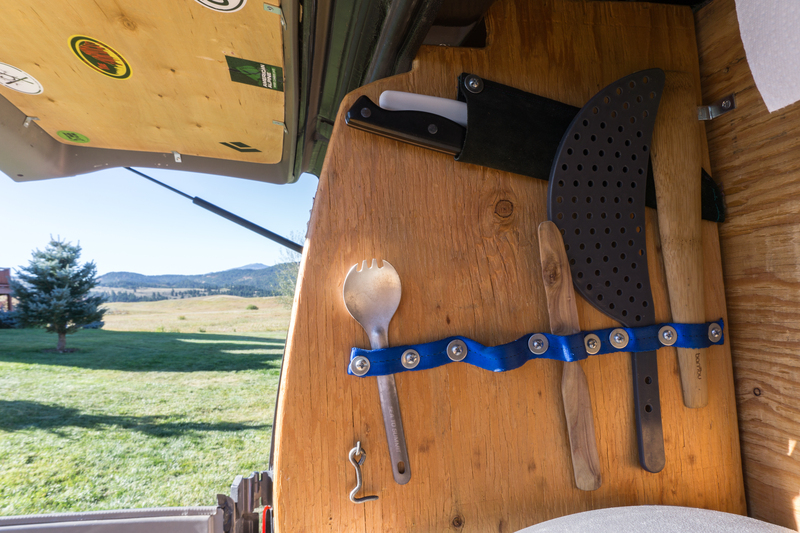 A cutting board also folds down to the right, which supports the fuel canister for the stove and provides a surface for cutting and preparing food. My favorite part of the kitchen is our refrigerator. It was definitely a game changer for us when it came to van life. 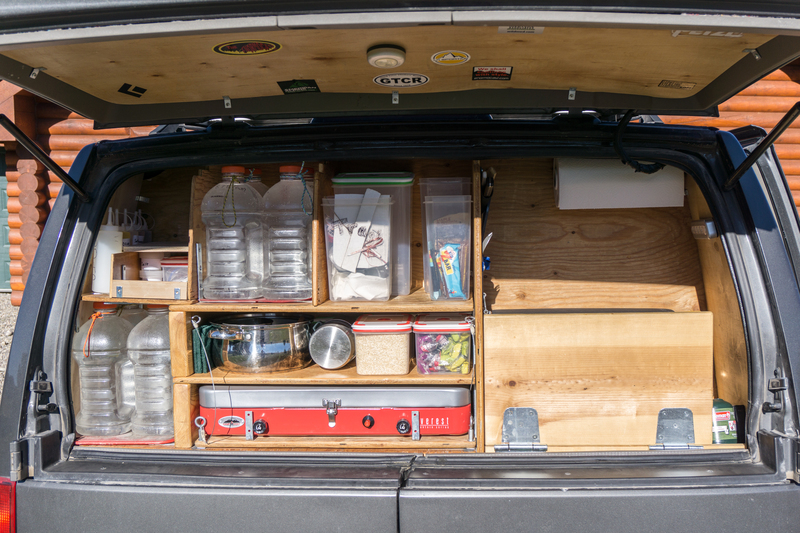 While living in our Pontiac Montana, we didn’t have the ability to store perishables. While we briefly experimented with using a cooler, it proved to be a huge challenge and didn’t seem to keep our food cold enough. Investing in our fridge was definitely worthwhile. Although it’s fairly small, it works perfectly for us to store the essentials and, as a result, has decreased the number of trips we have to take to the grocery store. 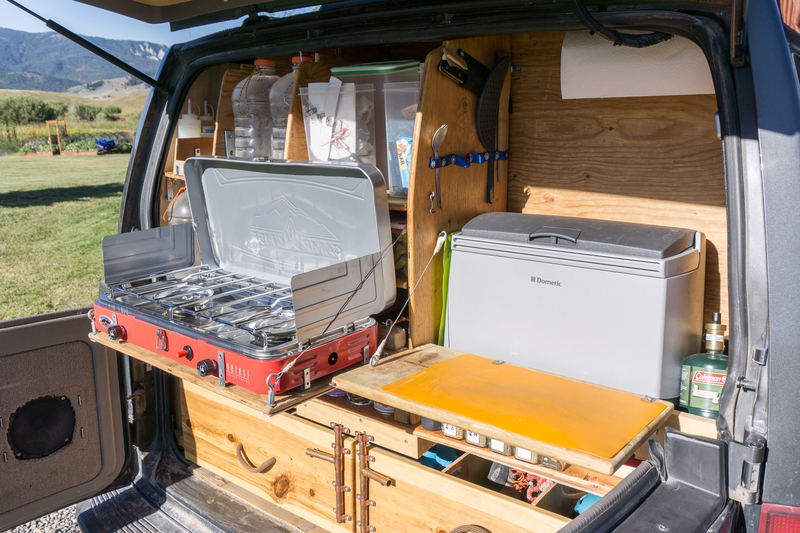 The fridge is powered by our solar panels, which also powers our lap tops, phones, and all other electronics in the van. Adam used a piece of webbing to make a utensil holder for our sporks, knives, and can opener. Like any house, there are always improvements to be made. The conversion seems to be a constantly evolving process of refinement. As with most everything, it’s all about compromise and, although it’s not always easy living in such a small space, to us it feels like home. Do you have a shower or toilet? There is no shower or toilet in the van. We have a shower head adaptor for the end of a platypus reservoir, which we can hang off the back of the van for showers in the summer. Otherwise, we used public showers (climbing gyms, community centers, etc.). Not in the van. We use public facilities for showering and restrooms. This is amazing Gina! I have been wondering what your van looked like. I figured it was specialized, but I had no idea it was customized to this degree. Adam’s work is really impressive. Those tiny tool drawers are my favorite, but the kitchen is a close second. Thanks Ang! We have made lots of little improvements over time based on what wasn’t working and what was. Adam even made us collapsible desks that attach to the front seats for working – I’ll get pictures up at some point!